Congratulations to Aki Energy, a member of CCEDNet Manitoba for receiving the Province of Manitoba’s 2015 Manitoba Excellence in Sustainability Awards! 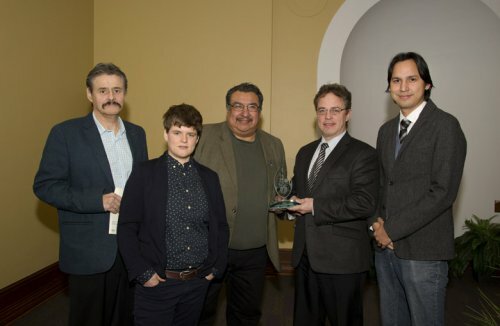 Aki Energy won the category of Action on Climate Change, Air Quality and Energy efficiency for their Indigenous-led social enterprise that is working with Fisher River Cree Nation, Peguis First Nation, Sagkeeng Cree Nation and Long Plain First Nation to develop community-wide geothermal energy systems and long term employment. At our 2016 Manitoba Policy Summit, Aki Energy submitted a policy on Community Owned Green Energy that urges the Province of Manitoba and Manitoba Hydro to build upon and scale-up their model by developing a strategy and allocating the necessary resources, to initiate the development of renewable energy on all 63 First Nations in Manitoba within 10 years. Another noatable CED organization, NorWest Community Food Centre, won the category of Sustainable Community for their work in providing access to healthy and accessible food, food skill development, community gardens and engagement in Northwest Winnipeg. This is relevant to CCEDNet’s policy work on food security through Creating Jobs and Improving Food Security in Northern and Remote Communities and in the development of Food Policy Councils.